Big changes proposed for Yonge Street in Willowdale, but will council agree? Will Toronto city council support transforming Yonge Street in North York from what’s essentially a highway into a tree-lined pedestrian-friendly street complete with bike lanes? Not if the mayor has his way. 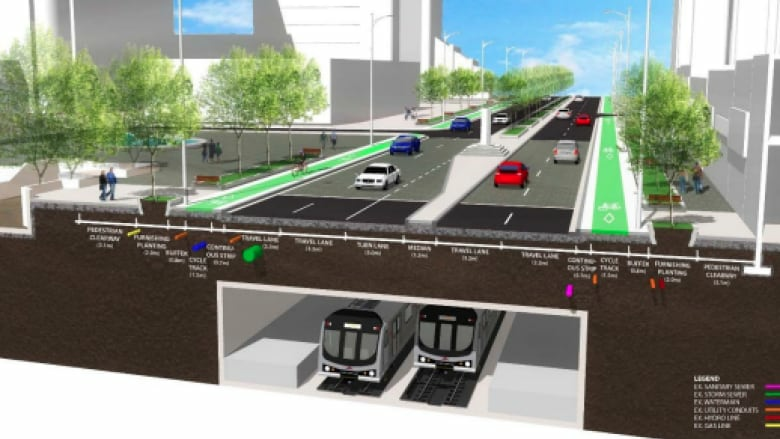 Will Toronto city council support transforming Yonge Street in North York from what's essentially a highway into a tree-lined pedestrian-friendly street complete with bike lanes? Coun. John Filion, one of two councillors who represent the area, is hopeful the answer is yes. But that won't likely come without a fierce fight at city hall. That's because Mayor John Tory is already voicing support for a more-costly alternate design, while right-wing councillors are also lining up to attack the changes. City planners are recommending reducing the three-kilometre long stretch of Yonge, between Sheppard Avenue and Steeles Avenue, to four lanes of traffic, while improving sidewalks and adding raised bike lanes. Those recommendations, which would cost an estimated $51.1 million, will be debated Friday morning at the public works and infrastructure committee (PWIC) meeting. Filion says his rapidly-growing neighbourhood deserves the new "urban vision" that officials are suggesting, rather than alternate approaches that treat it more like a suburb. "We have a sea of highrise condos, tiny little sidewalks and a six-lane highway between it all," he told CBC Toronto. There's more at stake than just creating nice sidewalks. Filion says the area, served by the Yonge subway line, needs to improve to attract more commercial activity and to become a more complete community. He says the residents he's spoken with at some 15 meetings are onside with that vision. Tory says he supports "bigger and better" sidewalks in the area and bike lanes, too, but not at the expense of narrowing Yonge. He's supporting a different version of the plan that would cost some $20 million more and move the bike infrastructure to nearby Beecroft Road. "I just think we can achieve the beautification of Yonge Street … without taking two lanes of traffic out in an area that has been identified in the city's own reports as one of the most difficult areas to manage traffic in," Tory told reporters this week. Former chief planner Jennifer Keesmaat, who is providing urban affairs commentary for CBC Toronto this year, says shunting the bike lanes off to Beecroft is the wrong move. She argues Tory, and those who agree with him, will be spending more money on a half measure. "You sort of need to go all in, go all urban, and the bike lanes are a really big part of that." Keesmaat says Willowdale needs all the urban amenities it can get — from sidewalk cafes to expanded park spaces — to improve its appeal. "A lot of this is actually about feel. One of the challenges that businesses have said is that it feels suburban," she said. Filion says he's not opposed to moving the bike lanes to Beecroft, but believes Yonge still needs to shrink to provide more sidewalk space. A city analysis dating back to 2010 shows 48 per cent of people take transit in the area and 45 per cent drive. Just six per cent of people walk, while one per cent cycle. However, the staff report notes intensification in the neighbourhood means more trips can now be made by foot or on two wheels. But some 55,000 motorists still take Yonge every day, with nearly three-quarters of rush-hour drivers hailing from York Region. Willowdale's connection to Highway 401 all but guarantees that will continue. Deputy Mayor Stephen Holyday, one of six councillors on the PWIC, says he hopes the committee will vote for Tory's preferred option. "I think the debate is about balancing the local desires with the larger city needs for a major road network that moves people and goods," Holyday said in an email. "Yonge Street is of regional importance and serves as a spine to connect the highways to local destinations." Coun. Giorgio Mammoliti, who also sits on the committee, is less open to the proposed changes. "The socialist Filion wants to create chaos," he said. Mammoliti warns narrowing Yonge would "block" traffic and lead to crippling congestion in the area. "That whole community is in an uproar." City staff don't appear to share those concerns. Traffic modelling shows travel time would only increase by one minute in 2021 — and that the version preferred by Tory isn't barely better. By 2031, the report states, traffic would only be 30 seconds faster if Yonge isn't narrowed. Transportation staff say that will be made possible by optimizing the remaining roadway, in part by removing hundreds of on-street parking spaces. Mammoliti says he doesn't buy that. He says if Filion gets this change passed, he'll be helping whomever tries to unseat the Willowdale councillor in the next election (Filion won by more than 6,000 votes in 2014). Dozens have already emailed the PWIC about the proposed changes, and many will likely show up at the 9:30 a.m. committee meeting. City officials plan to hold more public consultations in the near future. If approved, design work could begin this year with construction beginning as soon as 2020.